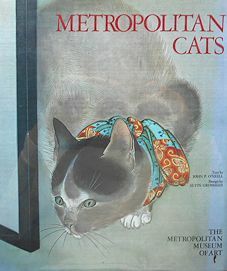 This previously owned hardback art book features cats from the collection of the Metropolitan Museum Of Art. The book is 9 1/4" x 11 1/4" and contains 112 pages of black and white and color illustrations. Each illustration includes a caption about the artist and the picture presented. Copyright 1981, dust jacket has been protected with a clear plastic dust jacket cover.